Indigestion, acid reflux and heartburn cause millions of people discomfort every day. Beneficial microbes don’t just help the lining of the gut and colon, they are also effective at dealing with issues higher up the digestive tract. Reflux is caused by pathogenic bacteria growing around the sphincter (muscles that encircle tubes and act as valves) at the top of the stomach, producing gaseous toxins which partially paralyse the muscle and allow food and gas back up the oesophagus (the muscular tube that connects the mouth to your stomach). These pathogenic bacteria typically colonise because the stomach is not acidic enough. The pH of pure water is 7, which is neutral. Anything lower than 7 is acidic and anything higher is alkaline. Dropping by 1 point on the pH scale is relative to increasing acidity by 10 times: a small decrease in pH actually means a big increase in acidity. The stomach is an acidic environment where gastric acids work to break down food. 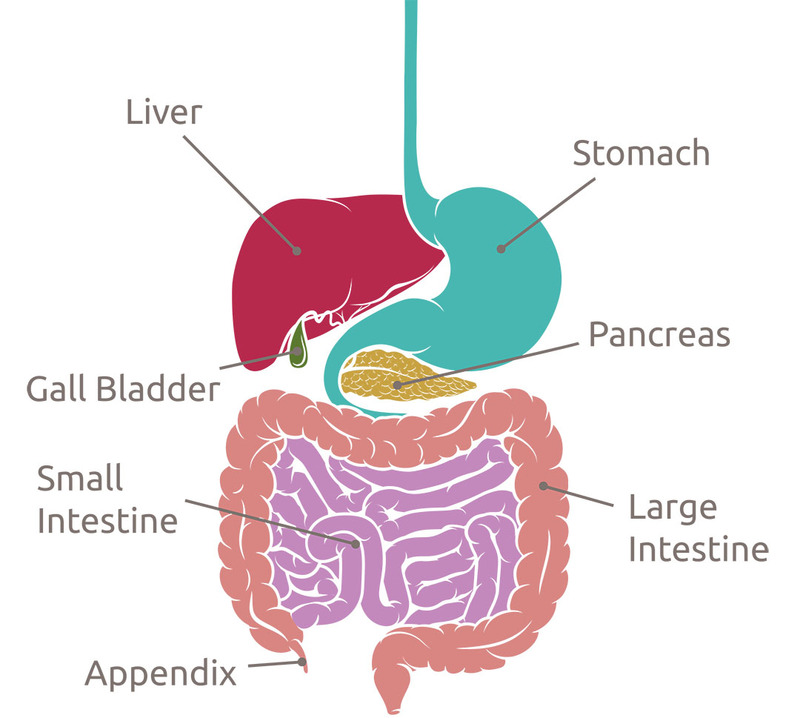 Pepsin, a protein-digesting microbe that breaks food down into amino acids, needs the stomach to be a pH of 3 or less in order to work properly. If the stomach produces less acid, then the whole digestion process is disrupted. Food coming out of the stomach needs to be pH 2 or below to stimulate digestion. If it is the correct acidity it stimulates the duodenum, the first and shortest segment of the small intestine, to produce two hormones. The first is secretin, which stimulates the liver to produce bile and the intestines to produce mucus, but most importantly it stimulates the pancreas to produce alkalising bicarbonate solution to neutralise acid. The rest of the digestion process is then an alkaline process. The second hormone is Cholecystokinin which stimulates the release of digestive enzymes in the pancreas and the emptying of bile from the gall bladder. Regular sufferers of acid reflux know the importance of eating a good diet to regulate their symptoms. Foods that are high in saturated fat, for example, can also loosen the sphincter muscle. Avoiding foods like chocolate, high-fat meats and alcohol that are high in acid is one way to reduce symptoms. There is some evidence that the body struggles to assimilate vitamins, minerals and food supplements and heal itself if the acid environment of the stomach leaks out and the alkaline process isn’t stimulated in the duodenum. As well as changes in diet, stress and a lack of physical activity can also cause acidification. The hiatus is an opening in the diaphragm, the muscular wall that separates the chest from the abdomen. Normally the oesophagus goes through the hiatus and attaches to the stomach but when a person has a Hiatal Hernia the stomach bulges up into the chest. Symptoms include very severe heartburn and reflux, regurgitation, chest, abdominal pain and possible vomiting. Maddie developed a hiatal hernia out of the blue in her mid-thirties. When it first presented the symptoms were so bad that she became very ill and suffered with extreme heartburn and reflux. She says “it was a real shock when I discovered, after a lot of trips to the doctor, that I had a hiatal hernia and it has changed my life. I now struggle to eat spicy food and foods that contain a lot of acid – they can make me very sick for days which is very debilitating. I’ve had to regulate my diet and really think about the food that I consume. Bio-Live is especially effective at helping to maintain appropriate acid levels in the stomach and the blood because as well as beneficial microbes, Bio-Live contains 50 organic herbs, a selection of crucial trace minerals and antioxidant boosting organic juices. It is hand brewed with purified water to pH 3.2 to survive the stomach acid. Most of the herbs included in Bio-Live, like cats claw and moringa along with the Noni organic juice have incredible anti-inflammatory properties which help balance the pH levels within the body. We hope you find Bio-Live helpful if you also suffer from reflux and indigestion and look forward to hearing your feedback.